Americans don’t watch TV shows anymore. We watch TV commercials and promos with 5- to 8-minute segments of the actual show thrown in every now and then for entertainment value. If you happen to miss any of the commercials, don’t worry; the networks have reserved the lower third of the screen for advertisers and the networks themselves to hawk products and coming attractions in “embedded crawls” while the actual TV show is in progress. 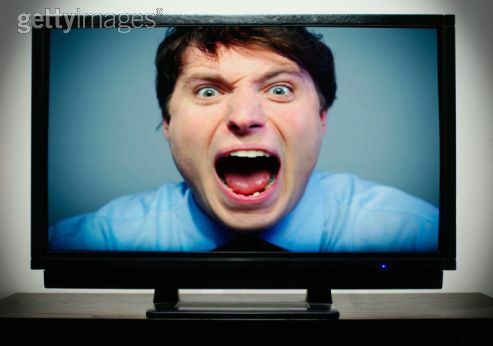 There’s nothing quite so enjoyable and conducive to the television viewing experience as some damned thing wiggling and waving at you beneath the TV show you’re trying to watch. And bits of “CSI: NY” squeezed into the top two-thirds of your screen every seven minutes. By the time you get back to the program—after 5, 6, 7 commercials crammed into one single break—you’ve forgotten the plot line and the characters’ names. But it doesn’t matter anymore because you are now deaf from the hair-blowing volume of the ads. As you try to read the actors’ lips in a futile attempt to rejoin the story, your mind begins to wander back to the days when the viewer was considered a valued customer–not just a mark. Commercial TV hasn’t always been this way. 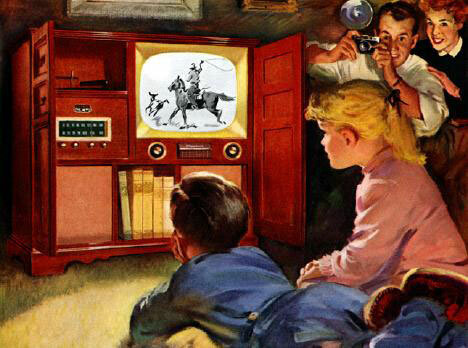 From the 1950s to the early ’70s, viewers, advertisers and the networks lived together in harmony. The implied message from the viewer: If you program good shows, we will watch them and we will tolerate a reasonable number of commercial breaks so you can earn enough money to program the shows and make a profit. In a way, the arrangement represented a kind of mutual respect among all parties. Back then, a typical hour-long TV show consisted of 52 minutes of actual show with eight minutes reserved for ads and promos. Generally, they would run two minutes of ads every 15 minutes or so. Quaintly, the show had the entire screen to itself. Occasionally, the networks would cheat a little by cramming one or two extra ads into the hour. But that was OK because viewers frequently violated the unwritten agreement by leaving the TV to go to the bathroom or by going to the kitchen to make something to eat during one or two of the commercials. For the most part, however, it was a win-win-win situation. We got to see our shows, companies got to sell us stuff, and for a few dollars and an almost-solemn promise to “serve the public interest,” broadcasters got to use the people’s airwaves and make piles of cash. Hell, you could build a bathroom during one of today’s commercial breaks. This is television: the major interface between corporations and the public, where you’d think media conglomerates and advertisers would at least try to show their best, least mercenary face. But no, by the time you’ve watched a couple TV shows (including the end credits which have been squashed over to one side, or run at mach 3 to make room for even more commercials), you feel like you’ve been walking down a carnival midway with the loudest, most obnoxious carnies in the world hollering at you about low insurance rates, full-bodied beer and erectile dysfunction. Update: It seems our legislature is actually trying to do something about the loudness factor with its Commercial Advertisement Loudness Mitigation Act (CALM). According to the Washington Post, the Senate recently voted “to require television stations and cable companies to keep commercials at the same volume as the programs they interrupt.” Democratic Senators Sheldon Whitehouse and Charles Schumer co-sponsored the Senate bill. Democratic Rep. Anna Eshoo was the champion of our ears and sanity in the House. Of course, there are still “a few problems” to be worked out before this becomes law. TV bigwigs have been saying for years that keeping commercials at a decent level is a difficult technical problem. If broadcasters are able to turn up the volume of commercials, they can certainly turn it down, I betcha. Anyone who has spent two minutes around audio gear knows that a little, inexpensive device called a “limiter” or a somewhat more aggressive version called a “compressor” can keep any audio signal within a set volume range. I have both of these gizmos in my ancient-but-operational home studio, for Pete’s sake. There are also a number of fancier loudness mitigators on the market. Britain has been using them to regulate the loudness of TV commercials in the UK for a while now; so can we. Now that it looks like we’re about to take care of the volume problem, let’s take care of the volume problem. While Congress is in a frisky mood, it should escalate this people’s uprising by demanding a sensible limit on the number of TV ads. Something along the lines of the European Union’s 12 minutes per-hour limit would be a good starting point. 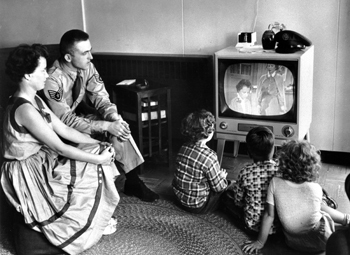 Hey, Americans might even start watching television again.